This late example of Safavid blue and white shows vividly the way different styles and traditions were synthesised by the craftsmen-potters of the day. The stream with the goose standing beside it and the flowering prunus tree come straight from Chinese blue and white porcelain designs, as does the upper landscape with birds, cloud scrolls and a single lotus blossom. So too the brownish rim, which is commonly found on seventeenth century Chinese porcelain. 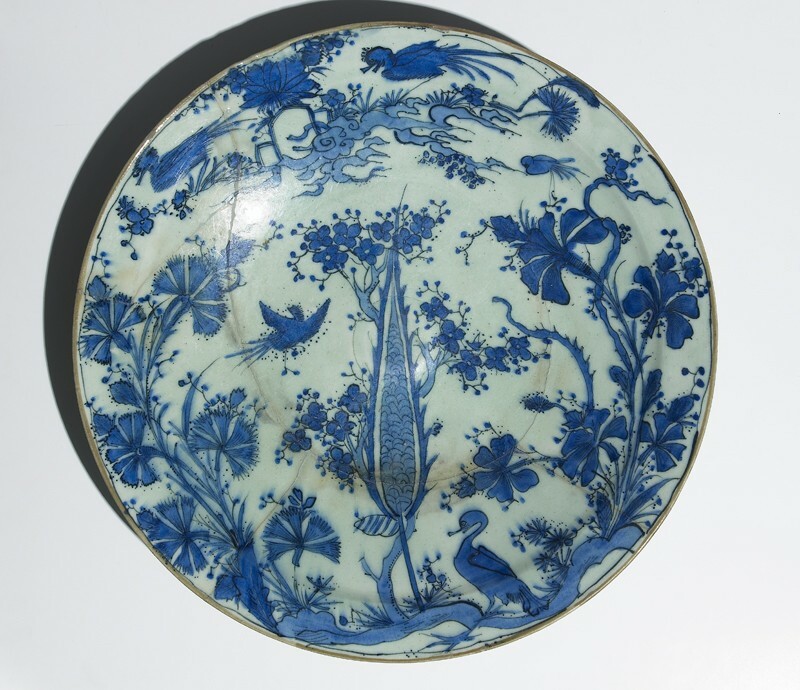 The central cypress and the irises on the right hand side of the dish are taken from the lustre tradition (nos. 34-35 [EAX.3080 & EAX.1207]), and derive ultimately from book illumination. The carnations, on the left, are rare items on Persian blue and white. 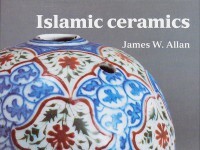 However they do appear on contemporary Kirman polychrome wares, in which they are used alongside a red – unique in Persian ceramics of the period. They may well have been introduced, therefore, by a potter who was acquainted with Iznik ceramics, on which, combined with a strong sealing-wax red, they are a standard floral element from the second quarter of the sixteenth century onwards (no. 47 [WA1888.CDEF.C324]). Presented by Ralph Pinder-Wilson, 1986.